Insensitive (Incredible Nuclear Spin EvolutioN Simulation Tool Intended for Visual Education) is an application to simulate the NMR experiment based on the quantum mechanical density matrix formalism. It is available for Mac OS X 10.6 and above and iOS 5.1.1 and above. Full details can be found in Concepts In Magnetic Resonance, 2011, 38A (2), 17-24 DOI. The NMR experiment is usually described by a choice of three models that operate on different levels of abstraction: the vector model, the product operator formalism and the density matrix approach. The transition between these models poses a didactic challenge for teacher and student alike. 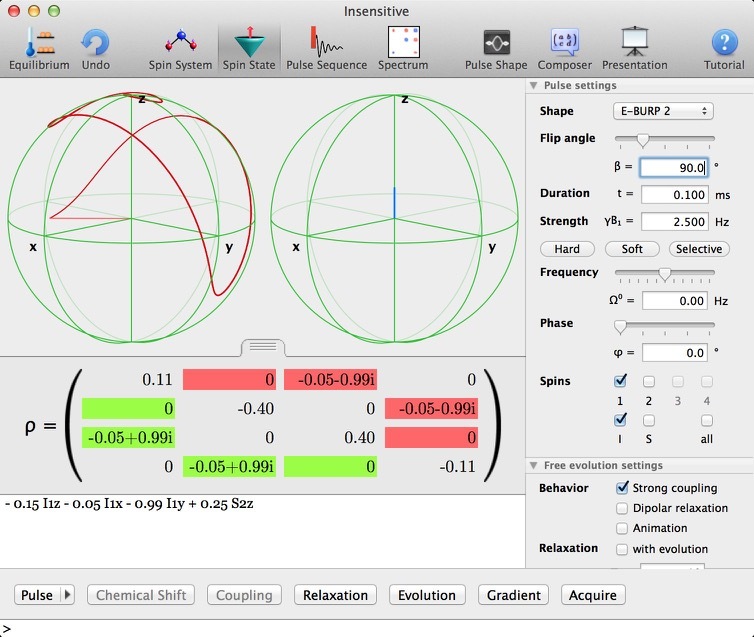 A new computer program is presented, which simulates a spin system on the textbook level and compares the three approaches, with the possibility to manipulate the system at every step. It closes a gap between NMR education and professional simulation tools. Some algorithms are explained, which are used in the simulation to extract information from the density matrix.